Iran offers huge economic potential. Can it deliver? It's been described as the Germany of the Middle East, with nearly 80 million people, an educated workforce, and a proud tradition of manufacturing. Throw in the world's largest oil and gas reserves, and it's easy to see why investors and international companies are getting very excited about Iran. After years of economic isolation, the prospect of the world's last major frontier market opening up in 2016 -- assuming sanctions are lifted as planned -- has many executives already beating a path to Tehran. But it's been an extremely painful time for Iranians -- average incomes have fallen by more than $2,000 since 2011, and Iran now produces just half the economic output of Turkey with roughly the same population. Closing that gap should mean opportunities abound. Sanctions have kept a tight noose around the economy for the past four years, holding businesses and the economy back. Pars Carpets is no exception. Tucked away at the back of the Grand Bazaar -- the beating heart of the capital city of 15 million, where trade has been conducted the same way for centuries -- the carpet seller proudly displays its specialist nomadic designs in colored silk and wool. Omid Omidvar, co-owner of Pars, explains what it means to have been shut out of the global banking system. "In some parts it's been very difficult, especially for transferring the money because we had so many tourists here, but they did not have the money to spend," Omid tells CNN in his cramped shop of just a dozen square meters. 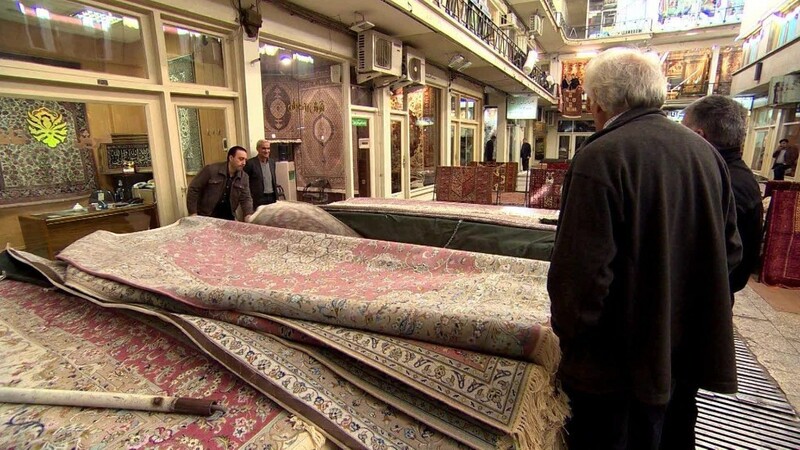 Tehran's so-called bazaaris are a powerful force, known in the past to be politically conservative and resistant to change. But Omid is looking forward to the day when expatriates return to the city, and international trade links are restored. Iranians are survivors, having worked around sanctions to keep their doors open. The Iranian rial has now stabilized, after losing as much as 80% of its value when sanctions were toughest in 2012. Inflation soared to 45%. While many are eager for relations with the West to return to normal, there's still plenty of disagreement about what lies ahead for this resource-rich country. Over coffee in the refurbished Masoudieh Palace, Alireza Purashraafi, an industrialist working in the auto and oil services sectors, told CNN he is waiting with great anticipation for the country to realize its full potential. His friend -- who asked not to be identified -- said he's considering options to leave instead, something Alireza described as "the wrong decision at the wrong time," since Iran is about to take off. Jewelry designer Anahita Ostadi has also struggled with the banking restrictions, as well as high taxes and daunting bureaucracy. "I hope in the future we have a country that is open to everyone, especially the U.S. and the others," Anahita told CNN. But it's at odds with the country's hardliners. Supreme Leader Ayatollah Ali Khamenei said recently that he wanted to "seriously avoid importing consumer goods from the United States." Still, businesses are preparing to cater for that demand. Opened just 15 months ago, The Kourash Complex is the first ultra modern mall in Tehran. It has more than 500 stores, and attracts 40,000 shoppers a day. "In my opinion, yes they want U.S. products," said Ali Rezaei, owner of "Ave est" -- one of the first men's retailers to open up in the complex. Amir Rizai, the mall's manager, says "Iran's Golden Times" are just two to five years away. If all goes well, Iran could see economic growth of nearly 6% in 2016, and 6.7% the following year, according to the Institute of International Finance. That compares with less than 1% projected by the IMF this year. The upbeat forecasts assume that the government of President Hassan Rouhani manages to navigate change successfully. Iran is on the cusp of ending years of economic isolation; a younger generation is yearning to open up, but the hardliners are pushing back, unwilling to give up the way they have done business for decades.